We have been providing Michigan with quality pest control services since 1994. We have been giving both commercial and residential clients the peace of mind in knowing that a single call to Knock 'Em Out Pest Control can be the answer to pest, rodent, and animal problems. Had an ant problem for a number of years.....tried a few things nothing worked. Called Knock'em Out Pest Control and they took care of it. I haven't had a single ant since. They are very professional and know what they are doing. I would highly recommend. This guy should be a driver for Jimmy Johns - freaky fast! From the placement of the order to delivery of report unbelievably fast turn time. Thanks! Knock 'em Out went above and beyond my expectations in terms of customer support and service. Lenny answered my many questions and was always polite and professional (even with my many phone calls). Making an appointment was easy and hassle-free. When Knock 'em Out came to do the inside/outside maintenance, they were friendly and helpful. I am incredibly impressed with my experience with Knock 'em Out, especially with Lenny in particular! Came out as promised. Very nice and personable. Have seen a drop in Box elder and stink bugs.! The representatives that came out to spray for yellow jackets in my chimney were very professional and polite. They did an excellent job going over everything. A LIVE person answers the phone! Scheduled the service for the next day. Good work. They came to the house quickly, and, went to work. Within one hour, the bees were gone. Highly recommended. Best pest control business out there. So pleased! Great, fast service. Very informational and professional! Would recommend to anyone. Highly recommend Knock 'em Out Pest Control. Not only did we have a huge in ground nest of bee's in the backyard, but a pervasive yellow jacket nest in the siding of the house. The first visit was very professional, and took care of the problem exactly as they said it would. I appreciated their timeliness, attention to detail, and professionalism (despite all my questions) and pricing exactly as quoted. Unfortunately we were re-infested with yellow jackets. Knock 'em out came back and again did a great job to ensure we would be yellow jacket free. Totally appreciate their skills and ability to empathize with my dislike of these insects being in my house! Thank you for a job well done. I'll be utilizing you again if the need arises. Quick response. Professional, informative, thorough! Would definitely use services again if needed. Definitely recommend! The ants were marching two by two now they have been stopped in their little tracks. Such a relief, reduction of spiders, pill bugs, no ants and reduced wasps and bees would highly recommend knock em out pest control. Hassle-free, mosquito-free summer! Happy customers here! The name says it all. It knocks out mosquitos like crazy. I can enjoy my yard again! The owners are friendly and very pleasant to work with and I found the price reasonable for the size of my property. I never expected to have same day service but that is what you did ! Thank you when you have a pest problem that is what I needed! These guys do a great job, we have used them for years with no problems !!!!! Professional service & great products. Even for our huge yard- we notice a BIG difference!! We're very happy with the response, friendliness and results. Lenny did an outstanding job of removing bats from my attic; no more bats or bat bugs. He was quick, professional, and the costs were reasonable. I would definitely call them again if I needed additional pest control. Yellow Jackets had eaten through our drywall and we woke up to a room full of swarming insects. I called Knock 'em Out Pest Control right away and whether our situation was an emergency (or not) they treated it like it was because we thought it was an emergency situation. They came right out and extracted the nest and killed the yellow jackets that were searching for their home. Thank you very much for coming out right away to remedy this very uncomfortable situation. Will recommend you to anyone with an insect problem. Called them in the afternoon and they were out the next day to address my bee problem.I didn't even ask what it would cost.. When i seen my statement,it was only about half of what i expected,so here i am,writing my first review ever. Excellent customer service, professionalism, and work. Took a couple minutes to take care of 2 yellow jacket nests in basement that has been wreaking havoc. Offered to follow up and come back free of charge if the problems persist. Great company. Very professional. Easy billing. They got rid of my ear wig problem when others failed to. We contacted 'Knock 'em Out Pest Control' because we had a nest of yellow jackets in our home. They sent out their serviceman, Lenny, to take care of the issue and he did just that! Lenny was very professional, friendly and took care of the problem quickly. Lenny is definately an asset to your company. Thank you for your excellent service! Technician was on time, thorough and friendly. Great customer service. Very quick and efficient and answered all my many questions. Len came out exactly on time, extremely friendly and professional. I had a huge wasp nest inside the roof of my daughters room. He quickly killed the wasps and removed the very large nest. They were coming through a hole in my foundation , he showed me, next to the front door making home entry a flirt with disaster. Poor dog got stung waiting to come in! We had to start using the back door! His work was an immediate improvement and the charge was more than fair for that dangerous job. This is second time I've used their services and I will use no one else. Communication is excellent. .they return phone calls..emails etc. Service guy very informative and friendly. fast and professional! would recommend this company to anyone! I have been customer of Knock 'Em Out Pest Control for 2 years and am absolutely 100% satisfied with their services. They are prompt and courteous. The driver is always very pleasant, polite and professional. The cost is very reasonable and I would highly recommend this company. Prompt, always there when they say , application products really work, we live in the country on 4 1/2 acres with no mosquitoes anywhere around the front t deck and lawn and especially our entertaining deck in the back. I'm very happy with Knock'em Out Pest Control and I'm gonna call them next summer for mosquito control again. We can hang outside and not be bothered by mosquitos and it's wonderful. 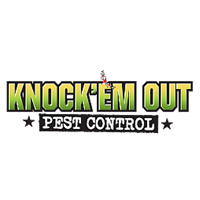 I have used Knock'em Out Pest Control for several years at both at my residence and business properties. I have found the personnel to be friendly, thorough in completing applications/jobs and fairly priced. Within 4 hours of my call, Lenny was out to take care of the nest of bees in my bathroom ceiling. He was very prompt, courteous and professional. I could not be happier. He was polite, informative, and anxious to solve my bee problem. You guys are great! You took care of our yellow jackets/bees last year & now again this year! Thank you for the speedy service & thanks for making sure my little guys don't get stung! If need arises will definitely contact "Knock 'em Out Pest Control" again -- they responded quickly, handled the issue (Eastern Yellow Jackets), and explained exactly how the Yellow Jacket life cycle works -- we really appreciated that! We moved into a new (older) home that had several insect issues....Knock Em Out came to our rescue quick. We are set up on the 5 star service plan which seems to be an economical/smart choice going forward. So glad we called! Excellent service. Great to work with. Very professional, will definitely recommend them to anyone I know. Knock 'em Out was wonderful. They fit us in right away on their schedule and were here right when they said they would be. They were professional and made us feel at ease with the yellow jacket situation we had. We will be signing up with a yearly plan and will use them for all of our needs in the future. Thank you.